We've said it before and we'll say it again (well, Laird probably will next month in our massive monitor group test), but the one part of your PC that you'll always use is the monitor. So you might as well make it a good 'un. 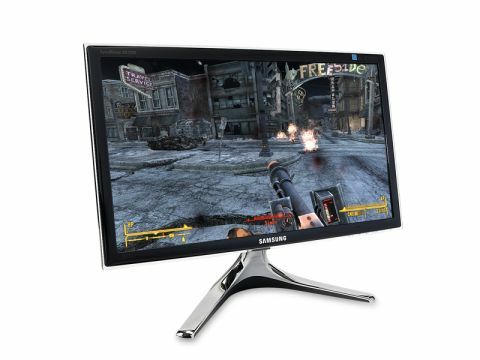 Samsung has traditionally been one of the top monitor manufacturers, offering bright, clear panels with accurate colour reproduction. The BX2350 is no different, giving a full HD (1,920 x 1,080) 23-inch screen in a beautiful surround. The first thing you'll notice about the BX2350 is just how slim it is. With that 16:9 ratio it's only going to take up width on your desktop, not depth. It's also got a rather impressive viewing angle too, with its MagicAngle tech offering different setups for where you're sitting. It is still a traditional TN panel though, so it's never going to match the superior IPS panels. But nothing's ever entirely perfect, and there is the odd niggle here and there – the main one being the rather useless plastic, chrome effect, stand. The limit of your adjustability is tipping the screen slightly backwards. There's no height adjustment and no swivel options, either, as the lightweight stand just, well, stands there. There's also the strange option of an audio output on the reverse side of the monitor. Realistically that's purely for plugging in a set of headphones, so why tuck it around the back? If you want to get some speakers plugged in, then why not jam them directly into the soundcard on your PC? Still it comes with two HDMI ports as well as the standard VGA port, and comes bundled with a DVI-to-HDMI cable so there's no worries about getting the thing plugged into the digital port on your graphics card. At £200 it's a stylish 23-inch panel, offering enough display options to keep most satisfied. That said, there are bigger screens out there for the same sort of price, which are LED backlit too.